As noted earlier, the former Marussia F1 Team has had its CVA (Company Voluntary Arrangement) approved on Feb 19th as planned, with the new Manor-Marussia F1 outfit to exit Administration whilst simultaneously hard at work to produce a "legal" 2015-spec F1 chassis. And in another sign of good news, apparently Manor went from Zero's to Hero's with reportedly two rival engine manufacturers jousting for the ability to provide them (PU) Power Units for 2015. With rumours claiming Ron Dennis has been pressing Honda for a second PU supply to create a true Honda 'B-team, whilst reportedly la Scuderia Sporting Boss Maurizio Arrivabene says Ferrari has a verbal agreement in place to supply 2014-spec Power Units to the Manor team instead. 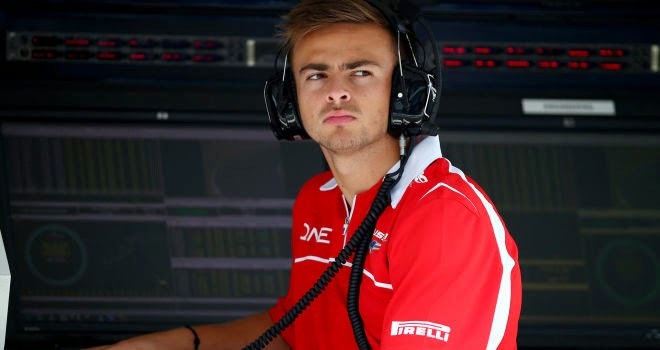 And while I'm all for Manor claiming its rightful spot upon the Formula 1 grid this season, I'm a bit disappointed that Manor's gone the Ferrari route, as it seems to Mwah that they'll be the third string this year, and then the fourth option in 2016 when Haas F1 joins the grid as Ferrari's de facto 'B-team, which surely must make both Sauber and Manor concerned over preferential engine supply to the newly flagged American Grand Prix squad, right? Hmm? Perhaps Ferrari's willing to give Manor a "Sweetheart Deal," possibly even going so far as forgiving part of its current engine bill, while its funny that the rival F1 Constructor's Huffed 'N Puffed over Manor running an updated 2014-spec chassis, yet apparently campaigning a year old Power Unit (PU) is perfectly acceptable; GO FIGURE! And although I wonder how this will make the Manor chassis capable of beating the 107% qualifying rule for the privilege of lining up "Tail-gunner Charlie" on the grid, nonetheless, I sincerely hope Manor does indeed resume racing this year and into the foreseeable future, even better yet, scoring more F1 Constructors points one day! Although I'd read two different versions of the team's new name, i.e. ; Manor F1 and Manor Grand Prix; it appears for unspoken legal reasons, the team will race this year as Manor-Marussia F1, albeit suppose the official nomenclature will be Manor Marussia F1 Team, eh?